Fukushima is one of those dream destinations in Japan that you visit and cannot easily forget. When you heard of Fukushima, it may remind you of the Fukushima Daiichi Nuclear Power Plant, that was badly damaged by the Tohoku earthquake and tsunami, took place on March 11, 2011. In spite of the incident, the prefecture has so many amazing things to share with its visitors, where natural disasters can’t be a barrier. It does hold a special charm! One of the seasonal attractions of Fukushima city is definitely Hanamiyama Park. Do you want to know about this park? Keep reading then. This is how it looks like in the spring in Hanamiyama Park. Photo Credit: www.hanamiyamakoen.jp. This cherry blossom viewing spot is considered one of the most popular in the Tohoku Region. 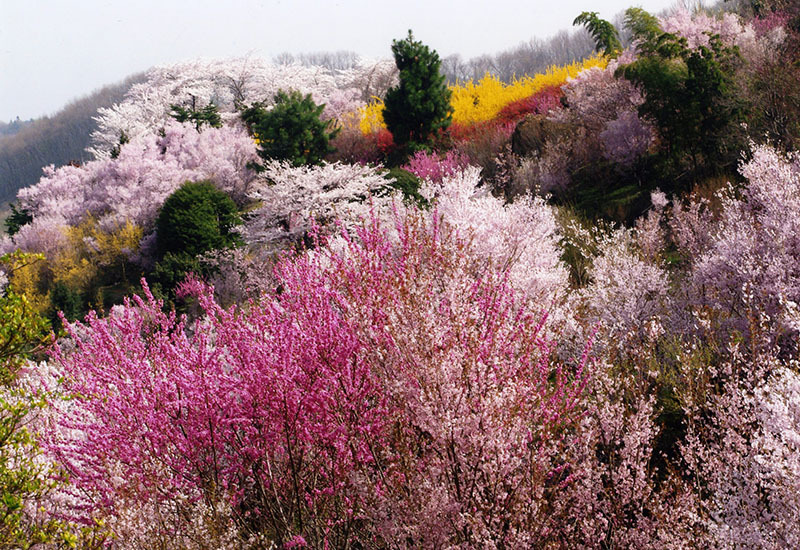 Located on the slopes of a mountain, Hanamiyama highlights different kinds of spring flowers such as cherry, forsythia, plum blossoms, tulips, nanohana (rapeseeds) and other types of flowers. Those of you, who want to see cherry and plum blossoms together in one place, a visit to this fairylike park is a must thing to do. There you can enjoy the surrounding impressive scenery alongside snow-capped beautiful views of Azuma Mountains in the distance. If you plan to travel to Tohoku in the coming spring months but not sure where to go, I would definitely tell you to visit Fukushima’s Hanamiyama Park. You must add this wonderful place to your itinerary alongside other notable hanami spots such as Kitakami Tenshochi, Kakunodate, and Hirosaki Park. Here, late march is the start of the spring flower bloom season. Anyone coming to this park from mid April through late April would enjoy viewing several varieties and species of flower blossoms. That’s the peak season and obviously the perfect time to enjoy hanami in the park. Variety of flower blossoms. Photo Credit: www.hanamiyamakoen.jp. This privately-owned and well preserved park has become a very popular hanami spot in Fukushima. Everyone loves to head to this park when most of the cherry trees on its slopes are in full bloom, aiming that they would enjoy a tranquil atmosphere within it. The idea of growing flowers in the area came from the Abe family in the 1920s. It’s indeed a flower paradise that was opened to the public in the year of 1959. The reason was to make it familiar to the public so that they can experience its exotic beauty throughout the spring months. From picturesque mountain views in the distance to the rich history of the park, to the colorful flower blossoms, Hanamiyama in Fukushima is a destination that will make your trip unforgettable. If you love nature and want to get active in the outdoors, visit the park and find out why it has been designated a place of flower paradise. Sea of flowers! Photo Credit: Wikimedia Commons. Many travelers enjoy taking a walk along the designated trails that allow them to explore the whole area thoroughly. No doubt that some of the trails in the park are steep. To reach the top of the hills, you have got to hike through those steep routes. And when you are finished climbing up, you will be happy to see the beautiful surroundings from there. Considering your walking capability and energy you should not run after all the trails. When you take a hike along the paths you would see many flowering plants nearby and be sure to encounter many viewpoints as well. From the viewpoints, you can capture many beautiful photographs featuring sakura, mountain range in the background, and Fukushima city. The place has plenty of areas for outdoor photography excursion. Please note that visitors are highly recommended to wear comfortable walking shoes. Every corner of the park looks pretty fabulous in terms of spring beauty. There, visitors can eat and buy local produce from the stalls. There is also a nice café to satisfy your stomach. Fukushima city from Hanamiyama Park. Photo Credit: Wikimedia Commons. The people of the neighborhood take a good care of this beautiful attraction. It’s true that if you love nature and often find a way to enjoy the outdoor beauty there are many things to experience except flower viewing. To reach the site, you have to take the shuttle buses that depart directly from Fukushima Station to Hanamiyama seasonal park station. The shuttle bus service is available only during the cherry blossom season. The one way ride takes about 15 minutes and costs 250 JYP. Then take a-10 minute walk to reach the park entrance. If you are looking for an alternative way to reach there, then take a taxi from the station. 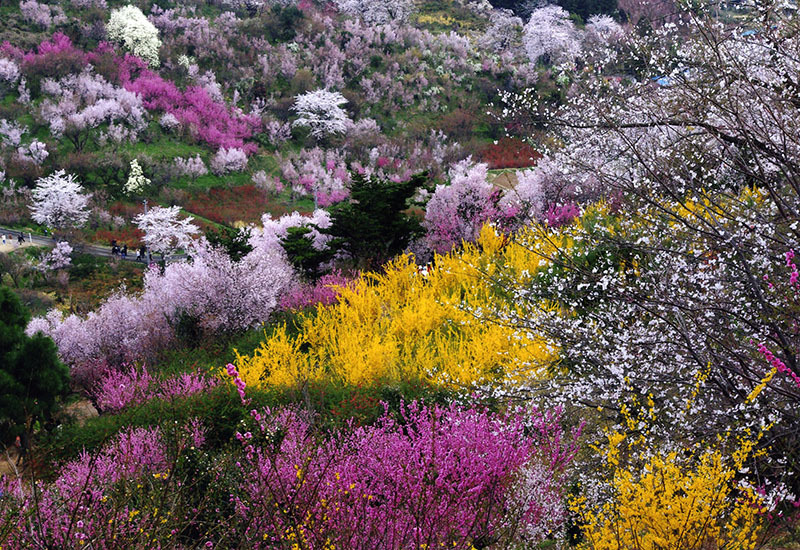 During peak cherry blossom season, the slopes of the hills gets covered by all shades of white, pink, yellow, and red. If you want to witness sea of colorful flower blossoms, come here and enjoy the weather while marveling at the blossoms and the Azuma Mountains range in the background. My description about the park here may not impress you, but the photographs surly do. I can assure you that when walking along the approach to the park, you can feel why it’s said the most beautiful hanami spot in Fukushima city.